By guest writer Manisha Shah: Lucie’s List subscriber, mother, software engineer, and childhood development nerd. You may notice your child is becoming more of an individual. She’s developing unique strengths and interests, and you’re starting to see her personality emerge — she may show delight in copying the things you do, repeat behaviors that make you laugh, or even give you the stink eye from time to time! As parents, we sometimes question whether we’re doing all we can to support our child’s learning and development. The good news: you don’t need to go crazy buying toys and games to stimulate your child’s development; you can provide an enriching environment with nothing more than some basic household items. You may have noticed your toddler using more gestures to communicate lately. For example, she may shake her head to communicate “no” (or push away, drop, or throw things across the room that she’s not interested in). She may also clap her hands to express happiness, respond to directions by pointing, parrot the sounds you make, and become increasingly talkative, giving name approximations to familiar items (e.g., “ba” for “ball”). 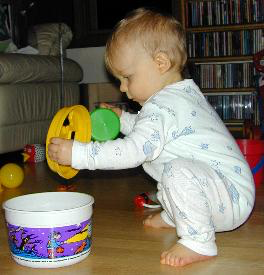 Physically, your baby is probably working on walking, and if she’s mastered that, she may be squatting down to pick up toys. On a cognitive level, you may start to see more advanced play, such as feeding a doll with a spoon, playing with a shape sorter, or turning your pots and pans into a drum set. Here are some activity ideas to give your toddler more opportunities to explore these emerging skills. For more personalized ideas for your child, you can sign up for the Playfully app (for free!) here. Set up an obstacle course in your living room made of pillows, blankets, and other soft materials. Try to create obstacles your child can climb over, under, around, or push aside. Have your toddler start at one end of the room and encourage him to move through the obstacle course on his own. The prize? You and/or one of his favorite toys will be waiting for him at the other end with a hug and high five. Offer help when he needs it (after giving him a little time to try to figure it out himself), and celebrate when he makes it through. Some children do better with a model, so get down on your child’s level and try out the obstacle course yourself! Put grocery items into a small bag, such as fruit, cheese, etc. Find a low cabinet your child can reach, or have her hand you items for you to put away. Have her “put away” the grocery items. When she picks up an item, tell her what it is (“that’s an orange!”). You can also practice simple spatial words, such as “in” or “on” while you play with the groceries. Use short sentences paired with gestures to help her understand what you mean. Don’t be surprised if she decides part of the game is taking everything back out of the cabinet and doing it all over again. This is her way of showing you she wants to play again, and at this age, repetition is often the best way to learn! Set a short timer on your phone so your child is familiar with the ringtone that goes off when the timer is done. You can also use a kitchen timer. While your child is covering his eyes, hide your phone somewhere in the room that he is capable of reaching (or have an older sibling or another adult hide it for you). Remember: at this age, your toddler may not really “cover” his eyes, but he will probably give it a try for … about a second! When the timer goes off, encourage your toddler to find the phone by following the sound, providing hints when necessary. To make this a little easier, you can also hide your phone while it’s playing music so your child can hear it the entire time. If your toddler is struggling to find the sound, help guide him with gestures and prepositional words (e.g. : “Is it UNDER the couch?”) to support his developing language skills. One of the best ways to promote your little one’s learning is through play, so channel your inner child, get down on your toddler’s level, and act a little ridiculous. 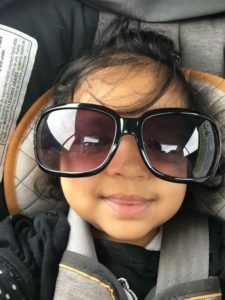 Adding some fun into your day-to-day is an incredible way to connect with your child while also supporting her development. From Playfully, an app and newsletter that tells you everything you need to know about supporting your child’s development through play. Click here to download a PDF of our favorite activities.